Merges global nodes or subtrees from source into destination. destination and source Local variables, process-private globals, or globals to be merged. If specified as a class property, the source variable must be a multidimensional (subscripted) variable. MERGE destination=source copies source into destination and all descendants of source into descendants of destination. It does not modify source, or kill any nodes in destination. MERGE simplifies the copying of a subtree (multiple subscripts) of a variable to another variable. Either variable can be a subscripted local variable, process-private global, or global. 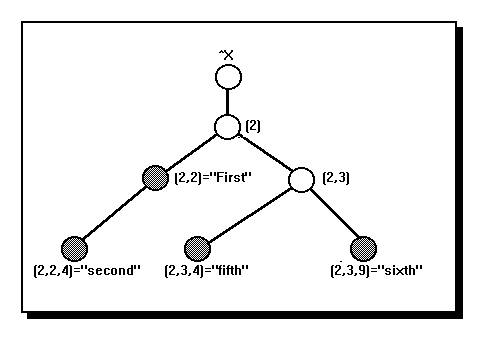 A subtree is all variables that are descendants of a specified variable. MERGE offers a one-command alternative to the current technique for doing subtree copy: a series of SET commands with $ORDER references. MERGE issues a <COMMAND> error if the source and destination have a parent-child relationship. The MERGE command can take longer than most other ObjectScript commands to execute. As a result, it is more prone to interruption. The effect of interruption is implementation-specific. Under Caché, an interruption may cause an unpredictable subset of the source to have been copied to the destination subtree. An optional postconditional expression. Caché executes the MERGE command if the postconditional expression is true (evaluates to a nonzero numeric value). Caché does not execute the command if the postconditional expression is false (evaluates to zero). For further details, refer to Command Postconditional Expressions in Using Caché ObjectScript. Variables to be merged. Either variable can be a local variable, a process-private global, or a global. If destination is undefined, MERGE defines it and sets it to source. If source is undefined, MERGE completes successfully, but does not change destination. A mergeargument can reference a destination=source pair by indirection. For example, MERGE @tMergeString. 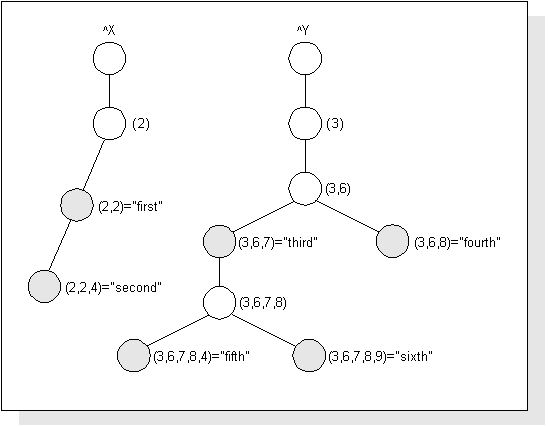 The following example copies a subtree from one global variable (^a) to another global variable (^b). In this case, the merge is being used to create a smaller global ^b, which contains only the ^a(1,1) subtree of the information in ^a. The following example shows how a destination global variable looks after it has been merged with a subtree of a source global variable. The following figure shows the resulting logical structure of ^X and ^Y. When you issue the previous statement, Caché copies part of ^Y into ^X(2,3). The global ^X now has the structure illustrated in the figure below. When both destination and source are local variables, the naked indicator is not changed. If source is a global variable and destination is a local variable, then the naked indicator references source. When both source and destination are global variables, the naked indicator is unchanged if source is undefined ($DATA(source)=0). In all other cases (including $DATA(source)=10), the naked indicator takes the same value that it would have if the SET command replaced the MERGE command and source had a value. For more details on the naked indicator, see Naked Global Reference in Using Caché Globals. When the destination and source are the same variable, no merge occurs. Nothing is recorded in the journal file. However, the naked indicator may be changed, based on the rules described in the previous section. The MERGE command supports watchpoints. If a watchpoint is in effect, Caché triggers that watchpoint whenever that MERGE alters the value of a watched variable. To set watchpoints, use the ZBREAK command.